Doors and their surrounding architecture can tell you a lot, but they can also leave you pondering the history of a place. 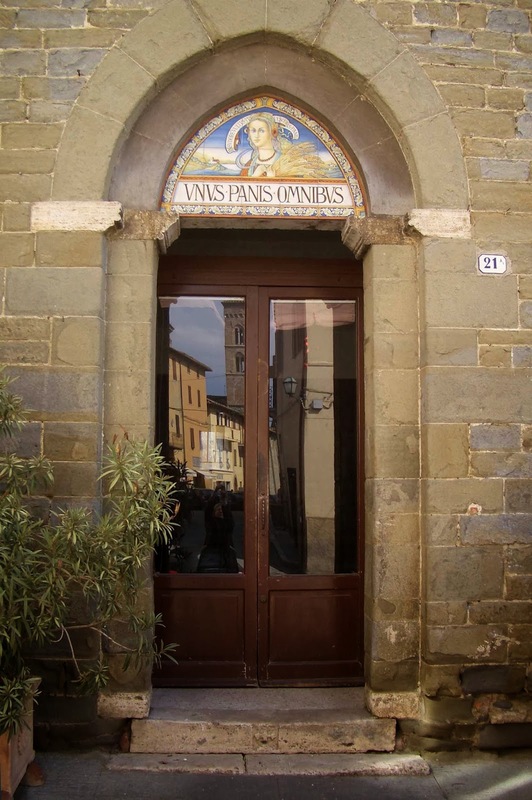 Deruta, Italy, is renowned for its ceramics, so many of the buildings are embellished with tiles, plaques or bas reliefs. Buildings change hands and the decorations no longer relate to their present occupants. This young woman with sheaves of wheat poses above a Latin inscription proclaiming "Bread for All." Too bad this isn't a bank. The reflection of renaissance-era buildings lured me on down the street to search for more of these colorful mysteries.